Seventy-five registered leases, including 40 approval lease notices for 99 year leases were handed out to residents in the wider Nadi and Sigatoka area yesterday. 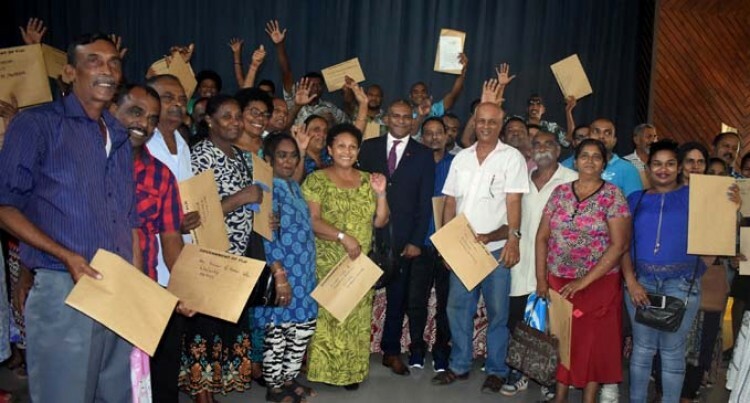 The recipients received their notices document notices from the Minister for Lands and Mineral Resources, Faiyaz Koya, at the Nadi Civic Centre. Among the jubilant crowd was Malolo Transmitter resident, Paras Ram, 43, who said he was grateful that his hope for a lease had been realised. Veniana Marama, 50, originally from Naivicula in Tailevu said: “We received a call about our lease. When we came to the Civic Centre with my husband, we came to know that we will be receiving our lease today, we were so happy today. Roshni Lata, 49, felt that Government should continue to lead the nation. Apenisa Tuoti, originally from Namoko, Navosa, said: “It’s about 15 years, I have been living in Nadi. I have been working in a hotel in Denarau for six years and now I have other thing to take care of. I thank God for today. “When I received the lease today from the minister I felt so contented and secure. I just can’t wait to tell my wife the good news. Mr Koya said that Government initiatives had assured that all promises would be fulfilled. “The Government had issued 173 registered leases in the Western Division. “The ministry likes to remind you all that for the past, the current and the future recipients that you must take heed of the term and conditions outline of these leases. This is a legal obligation and you have a role to play so please do this with honesty and integrity,” he said.